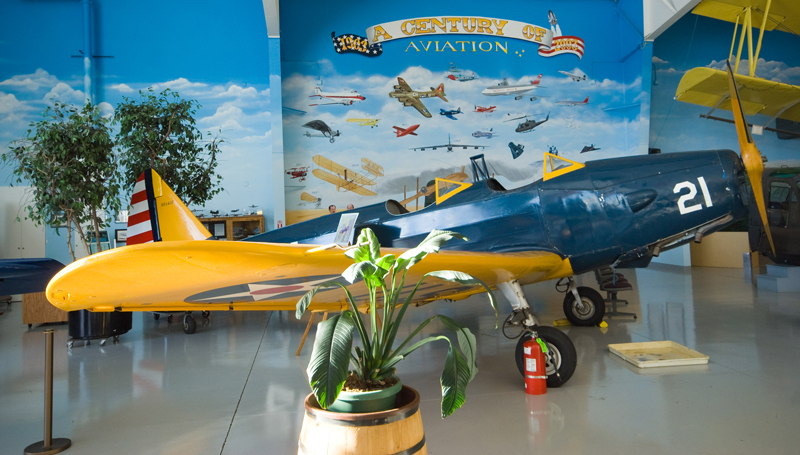 Our museum gives you the rare opportunity to see and explore two hangars full of aircraft ranging from a Wright Brothers’ flyer to the Global Hawk unmanned surveillance aircraft. The majority of our planes are still able to fly and everyone gets excited when we hear the rumble of an engine on the ramp. You are welcome to wander solo or you can contact our office in advance to schedule a group tour with one of our veteran pilot guides. We also offer audio tours guaranteed to help you learn something new about one of our featured planes or the legacy of aviation. Can’t wait for your visit – read up on some of our planes below. Called the “Mustang”, the P-51 is perhaps the best-known fighter of World War II. With its Rolls-Royce Merlin engine, the P-51 quickly became the war’s dominant fighter plane. It was thought of as a “knight in shining armor” by the many bomber crews it escorted. After the war, the P-51 remained in US service with the Strategic Air Command until 1949, and with the Air National Guard and Reserves into the 1950s. It became one of the first fighters to see combat in the Korean War. The RAF’s Fighter Command used them until 1946. In addition, over 50 air forces around the world acquired and used the Mustang for many more years, some as recently as the early 1980s. When the US Air Force realigned their aircraft designations in the 1950s, the Mustang became the F-51. The Global Hawk is an unmanned arial vehicle (UAV) surveillance aircraft. It as initially designed by Ryan Aeronautical, and know a Tir II+ during development. It can survey as much as 40,000 square miles of terrain per day. This particular DC-3 was built in 1939 and served for Australia during WWII and was surplussed in 1945. It then went to Canada and served for their Department of Transpiration until 1995. In 1995, Robert Odegaard and Rob Challans under the direction of Mitch Carley, had SkyHarbour, Canada restore and rechristen the DC-3 as Duggy - The Smile in the Sky! The Flyer was based on the trial and testing of gliders at Kitty Hawk between 1900 and 1902. Their last glider, the 1902 Glider, led directly to the design of the Flyer. As with gliders, the pilot of the Flyer would lay on their stomach on the lower wing with their head towards the front of the aircraft to try to reduce the drag. They would be able to steer the aircraft by moving a cradle which was attached to their hips and the cradle would pull the wires which would warp the wings and turn the rudder simultaneously. This replica was made here at the Museum in honor the the 100th anniversary in 2003, and it rated as one of the best replicas in the country. The Bell UH-1 Iroquois is one of the most successful helicopters in history, with over 16,000 built between 1955 and 1976. First flown in 1956 as the HU-1A (hence “Huey”), it was primarily used to transport troops, medical purposes, cargo transport, and aerial attacks. It was powered by a single 700 shp Lycoming T53-L-1 turbo shaft engine turning a large two bladed rotor. The Pitts Special was a series of light aerobatic biplanes designed by Curtis Pitts. Its first flight was in 1944. Even though the design of this plane has changed continuously since the original prototype, the current Pitts Special still remains very similar to the original design concept. The Standard J-1 was designed by Charles Day, who also designed the famous Curtiss Jenny. This two seat trainer was primarily used by the U.S. Army Air Service to supplement the JN-4Jenny. The construction of this aircraft consisted of wire-braced wood with a canvas covering. It had about 100 horsepower that was driving a two blade wooden propeller. Performance topped 72 miles per hour with an endurance of three-and-a-half hours of flight time. The J-1 at the Fargo air Museum is the oldest aircraft in North Dakota, with it being 90% original. The Texan originated from the North American NA-16 prototype. The first model went into production and 180 were supplied to the USAAC as the BC-1 and 400 to the RAF as the Harvard I. The US Navy received 16 modified aircraft designated the NSJ-1, and further 61 as the NSJ-2 with a different engine. It remains a popular warbird aircraft used for airshow demonstrations and static displays. Rearwin Aircraft and Engines introduced the Skyranger in 1940 as a sid-by-side, two-seat cabin monoplane. Designed by Gene Slvay and George A. Stark, the Skyranger was first flown on April 9th, 1940 and given Aircraft Type Certificate #729. The Lancair 360 is a homebuilt experimental airplane built & eventually donated to the Fargo Air Museum by Jim B. Frantz. Built Entirely by himself, it took Frantz a total of 5,500 hours over 4 years And 11 months to complete - from 1990 to 1995. The B-25 Mitchell was an American twin-engined, medium bomber manufactured by North American Aviation. It was named after Major General William "Billy" Mitchell, widely considered the father of US military aviation. The B-25 is a descendant of the XB-21 (North American-39) project of the mid-1930s. Experience gained in developing that aircraft was put to use in the B-25. Requiring 8,500 original drawings and 195000 engineering man-hours to produce this aircraft. 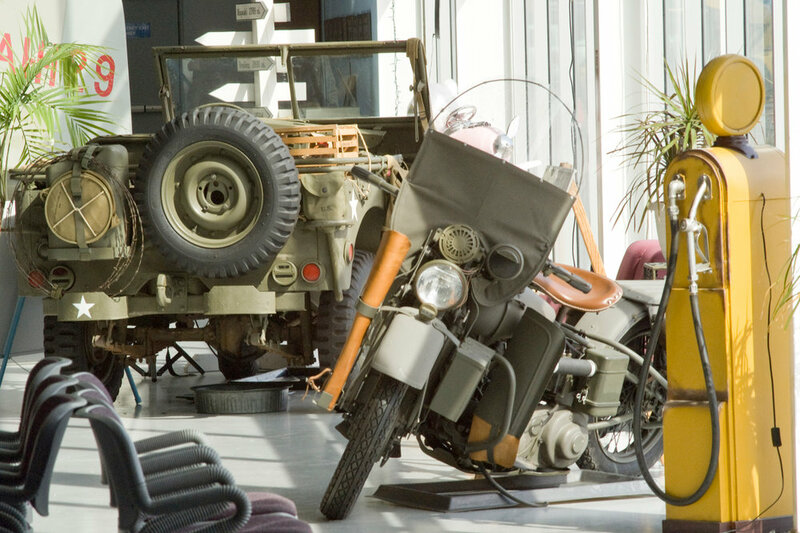 The Harley-Davidson WLA was produced to US Army specifications for use in WWII. Over 60,000 were produced for war-time use. The Taylorcraft L-2 Grasshopper is an American observation and liaison aircraft. It was produced by Taylorcraft for the United States Army Air Forces in World War II. In World War II, the AAF began using the L-2 in much the same manner as the observation balloon was used in France during World War I. It served in spotting enemy troop and supply concentrations then directing artillery fire on them. It was also used for other types of liaison and transport duties. Meyer's Special Little Toot is a single seat, open cockpit, homebuilt biplane with conventional landing gear. The Little Toot prototype was first displayed at the 1957 Experimental Aircraft Association convention in Milwaukee, Wisconsin. At this event, Little Toot N61G won the first place title for the Mechanix Illustrated Trophy for Outstanding Achievement. It was awarded second place for Outstanding Design. EAA founder Paul Poberezny flew Little Toot several times. The Fw 190A started flying operationally of France in August 1941. It quickly proved superior in all but turn radius to the Royal Air Force's most used fighter, the Spitfire Mk. V.
The half-scale flyable model was donated by Dave Gierszewski & Glen Anderson. It was built over the course of 13 years and flew for the first time in 1993.